The last few years of rock n’ roll icon Elvis Presley are becoming demystified, thanks to a new book by local music author and Capitol Hill resident Gillian G. Gaar. Her book, Return of the King: Elvis Presley’s Great Comeback, chronicles the last years of the legend and gives some new insight into what might have contributed to his tragic death in August of 1977. Gaar is reading from her book and signing copies at Elliott Bay Book Co. this Sunday, June 20th at 4 p.m. She is an established music journalist and author of She’s A Rebel: The History Of Women In Rock & Roll; Green Day: Rebels With A Cause; Nirvana: In Utero; and The Rough Guide To Nirvana. Her book looks at Elvis’ fated comeback tour and the the events of the last few years of his life. She interviewed family, friends and longtime King enthusiasts to build the story. By 1967, the King was fading fast with unimpressive record sales and lame movie roles. But then came the ’68 Comeback Special, which aired on NBC during the holiday season and brought life back into his career. He went on to perform almost 1,100 concerts between 1969 and 1977 before he died at age 42. One of Gaar’s favorite sources for the book is the man who set up Elvis’ infamous meeting with Nixon – UW law school alum and former administration official Egil “Bud” Krogh. Gaar said that when she first contacted Krogh, she was surprised to learn he had at one time the same Seattle ZIP code as her and hadn’t been interviewed much about Elvis. Elvis asked Nixon if he could become a member of the Bureau of Narcotics and Dangerous Drugs. He gave Nixon a pistol, and Nixon gave him a “Federal Agent-at-Large” badge. His fame has lived on and caught fire with a new generation. But while Elvis’ iconic status is undisputed, Gaar believes it’s still unclear how he perceived himself in those final years. 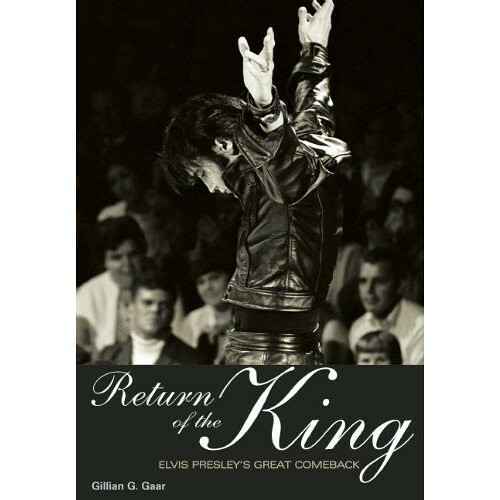 Return of the King: Elvis Presley’s Great Comeback is published by Jawbone Press, is available on Amazon and Elliott Bay Book Co. Gaar will be signing books on June 20 and will have some fun Elvis memorabilia to pass around during her reading. Check out the book’s Facebook page and join the Elvis discussion boards and to learn more. Nice to see an interview with a Capitol Hill author. Especially one like Gillian who has a such a history in this area. Please publish more articles about our local literary artists!